Disney Cruise Line’s newest ship grants all cruising wishes. If you’ve never seen a cruise ship christening, this is pretty much how it goes: Band plays. President of cruise line makes speech. Godmother releases bottle of champagne. Bottle breaks. Crowd cheers. The end. Not so with Disney Cruise Line. On a sunny day in January, we made our way to Port Canaveral, Florida, to watch award-winning singer and actress Jennifer Hudson christen the new Disney Dream, but what we saw wasn’t a typical christening at all. It was a show. The crowd of nearly 3,000 was entertained by full-on production acts complete with singing and dancing by nearly every Disney character you can imagine. The never-ending performances included giant characters like Mike from Monsters, Inc., Sebastian from The Little Mermaid, and Genie from Aladdin parading by on stilts, strutting to the sounds of a classic Disney music. Hudson, who actually got her start aboard Disney Wonder, sang her heart out and then welcomed the new ship. For the grand finale, a helicopter whirled in overhead to pick up a giant 16-foot bottle of (no, not champagne) “dreams” to break on the side of the ship, which set off confetti and fireworks. What a treat it was to watch a Disney-style naming ceremony, but this of course is what the line is known for. Entertainment all the way. So it was no surprise that sailing on Disney Dream continues the traditional of pure fun (with, surprisingly, a little relaxation thrown in for good measure). The third ship in Disney Cruise Line’s fleet, Disney Dream flawlessly combines what you love about Disney Magic and Disney Wonder, bumps up the size of the ship significantly (by about 40 percent and two additional decks), and adds several new innovations that sets Disney Dream apart from its predecessors — and every other ship in the industry. I felt we were a typical Disney-cruising family: my husband and I and our two daughters, a 5-year-old and a 21-month-old. For three days, we set out to experience all that the ship had to offer. What we realized is that three days is hardly enough time to do and see everything on our checklists. But with some careful planning — and not a whole lot of downtime to spare — we did most of what we set out to do and found out what the ship had to offer each of us. 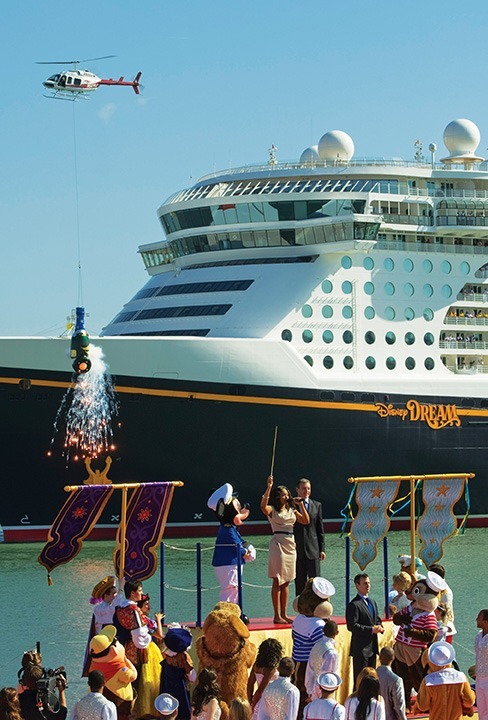 Disney Dream appeals to all ages, from toddlers to teens to adults. All have their own unique spaces to call their own, and all, when disembarking, want to come back for more. Adults will appreciate the ingenious split-bathroom design on Disney, which separates a sink and toilet area from a sink and shower/bathtub area. This means not only extra space, but that several family members can get ready simultaneously. Also, elevated beds offer ample space to shove your luggage, another stateroom plus for families. Even if you’re not staying in one, try to sneak a peak at an inside stateroom, which boasts one of Disney Dream’s innovations that is sure to impress: virtual portholes, which broadcast live outdoor images shot on high-def cameras that will show where you are in port or at sea. Of course, you’ll also see occasional Disney characters swimming by like Peach (the Finding Nemo starfish) or even Mickey Mouse himself. 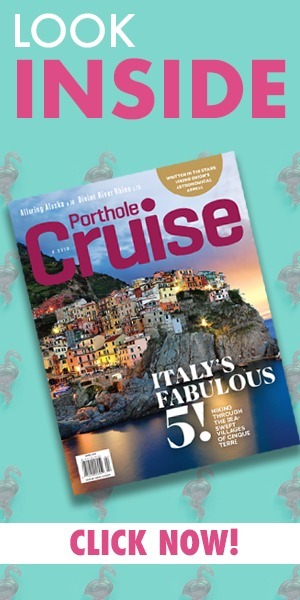 Nearly 90 percent of staterooms are outside, of which 90 percent have a private verandah. If you’re cruising with a larger family of four or five, book a Deluxe Family Oceanview Stateroom with Verandah, which offers 304-square-feet, compared to the 268-square-feet that you’ll get in the a Deluxe Oceanview Stateroom with Verandah. If you’re a veteran cruiser, you will notice — and enjoy — the extra space, especially if you have to make room for a portable crib, diaper pail, and other “stuff” that accompanies little kids. Disney’s rotating dining schedule allows diners to experience different venues during the cruise, from the Enchanted Garden (the rounded fairytale-like booths in the front were favorites for breakfast time) to the Princess-inspired Royal Palace. Of course, kids and adults alike will long-remember Crush, the friendly surfer-dude turtle in Finding Nemo, who swims around Animator’s Palate, appearing on various TV screens and conversing with diners in real time — a great distraction for antsy little ones, by the way. When the sun sets, head straight to The District, the adults-only evening entertainment area made up of five distinct lounges and nightclubs that range from 687, a contemporary sports bar, to the bustling Evolution night club to Pink champagne bar. Our favorite, though, was the Skyline Bar, which boasts ever-changing “views” of world-famous cities like Paris, Hong Kong, and New York City. Kids ages 3 to 10 will no doubt spend their time in the Oceaneer Club and Lab, two connecting areas that feature separate spaces to explore, like Monsters Academy, a fun interactive space to play; Pixie Hollow, a whimsical space where kids can play dress up; and Andy’s Room, where kids will find life-sized replicas of Toy Story characters like Slinky Dog, Mr. Potato Head, Rex, and Hamm. Teens have their own spaces at Vibe, an indoor/outdoor space for teens ages 14 to 17 that offers a fountain bar, media room, and a dance floor, and Edge, a lounge just for tweens ages 11 to 13 that is a loft-style space complete with plenty of high-tech entertainment. The Small World Nursery is the place for those 3 months to 3 years, where the wee little ones will be entertained with plenty of hands-on games and toys. Move over Monopoly. “Family Fun Night” is brought to a whole new level on Disney Dream, where the entire clan can take a seat for the amazing production shows like the timeless Golden Mickeys, the humorous Villains Tonight, and the line’s new heart warmer, Disney’s Believe. For even more action, head up on deck for the action-packed Pirates Deck Party, which is held each cruise and features pirate-themed games, entertainment, drinks, and the cruise industry’s only fireworks display from the ship. If you’re looking for something a bit more low-key than The District, make your way to Meridian, an adults-only lounge located between Remy and Palo. (Although you don’t have to be dining at one of the restaurants to come here.) This quiet, romantic space boasts a sophisticated nautical theme that pays homage to the early days of ocean sailing. Relax with a cocktail inside in one of the comfy chairs or booths or head to the breezy outdoor deck for some amazing views off the back of the ship. Kids will want to pay close attention to the scheduled character appearances in the atrium, around the ship, and on Castaway Cay. Don’t forget the autograph books as you head for these much-loved Meet & Greets, where kids can pose with their favorite Disney characters. On the last night of the cruise, try to keep the kids awake long enough for the final farewell, when a host of favorite characters are available for final goodbyes. The poolside movie theater, or “funnel vision,” is a great way to spend some quality family time. Check movie times and pick your favorite flick, and then head to the pool deck to watch it on the giant LED screen, all while lounging in the pool or on a deck chair. Even if you only have a few hours to spare, make the most of your time at the Senses Spa & Salon. While the spa menu boasts more than a dozen pages of spa treatments that are sure to turn you into jelly, know that you can also purchase a $16 day pass to the Rainforest Thermal Suite, where you can spend as much time as you want relaxing in an oceanview Jacuzzi, lying on heated chaise loungers, or soaking it up in a Turkish haman, steam room, or cold-shower mist. (Trust us. You’ll leave just as jelly-like.) End your alone time at the adults-only Quiet Cove pool and enjoy some quiet time with a drink, a book, or simply each other. A great escape for kids? The pool deck on port days. While other passengers were heading off the ship, we found that an early-morning trip to the pool meant less people vying for the precious pool space as well as shorter lines for the AquaDuck. For teens seeking their own relaxing retreat amid this bustling ship, the Chill Spa (located inside Senses Spa & Salon) is a separate spa reserved just for them that offers a variety of spa services and treatments, including facials, massages, and manicures. There is perhaps no better spot to regroup and recharge than on your own stateroom’s verandah, which is the perfect place to enjoy a quiet breakfast in the early morning as you watch the ship pulling into port, or in the evening to talk and reflect on your busy day. Yes, this is Disney, but don’t forget to check your Personal Navigator and make some time for scheduled wine tastings, beer tastings, whiskey tastings, martini tastings . . . you get the drift. On-deck activities: AquaDuck, Goofy’s sports deck includes miniature golf, sports simulators, and a basketball/volleyball court. Onboard shopping: Several onboard retail shops sell Disney memorabilia, clothing, duty-free liquor, and other souvenirs. Communications: Wi-Fi is available throughout the ship, including public areas and staterooms.